Good morning … Look how big this cow is! 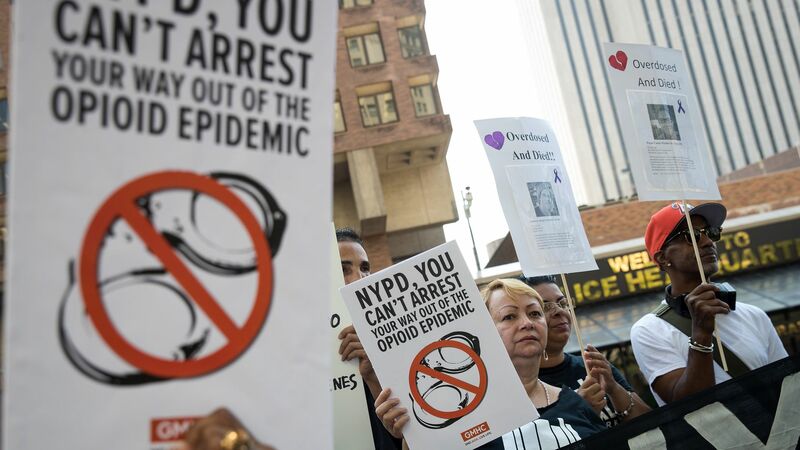 Congress' criminal justice reform bill has some implications for the opioid crisis, my colleague Caitlin Owens reports. High-level fentanyl and heroin traffickers would not be eligible for credits to reduce their sentence. These credits are available to lower-level inmates — many of whom have a substance abuse disorder — and can be earned through participation in treatment programs. The bill also would require the Bureau of Prisons to submit a report on a pilot program for medication-assisted treatment. What they're saying: "The bill comes far short of requiring BOP to provide treatment inside and to be linked to the treatment on the outside upon re-entry, [and] that's a huge missed opportunity," Northeastern University's Leo Beletsky says. "Shortened sentences are obviously imperative but if people are being released, there needs to be very specific re-entry work done to make sure they don't overdose and die," Beletsky adds. The bill is also limited to the federal system, while opioid users are often charged with simple possession or petty crimes that are generally prosecuted at the state and local level, Stanford University's Keith Humphreys tells Caitlin. Democrats and a lot of independents want Congress to tackle health care, but Republicans aren’t into it. That’s the takeaway from the Kaiser Family Foundation's latest health care tracking poll. By the numbers: A strong plurality of Democrats — 27% — listed health care as the issue they most want the new Congress to address. Among all respondents, and among independents, health care came in second to immigration by just 1 percentage point. But Republicans were more interested in immigration by a 30-point margin. Among all partisan subgroups, “affordability and cost” was the primary health care concern. “Health care for everyone” came in last even among Democrats. The poll also found widespread support for the Trump administration’s plan to put drugs’ list prices in their TV ads — even after hearing that the information may not be super useful to consumers (because people will pay different prices depending on their insurance). Amazon is expanding its health care business beyond prescription drugs and medical supplies. The company is also developing software to read and analyze electronic medical records, the Wall Street Journal reports. The new software will likely be similar to existing Amazon offerings "in areas such as travel booking, customer support and supply-chain management." Amazon says it has trained the software not to get tripped up by the misspellings, abbreviations and other abnormalities that have posed problems for other text-reading services. This is part of Amazon Web Services, separate from its acquisition of PillPack or its partnership with JPMorgan Chase and Berkshire Hathaway. A common refrain from telehealth advocates is the technology will help people in remote areas get routine care and checkups they otherwise wouldn’t. But new research shows rural dwellers are a really small portion of patients who actually use telehealth services, Axios’ Bob Herman reports. In a new study published in the Journal of the American Medical Association, researchers analyzed more than a decade of medical claims from a large health plan, covering 2005 to 2017. 83% of that population who used telehealth lived in urban areas. The bottom line: Telehealth is still both very uncommon — less than 7 annual visits per 1,000 people, according to the study — and mostly used as a convenience for people in bigger cities. A pair of professors at Penn's health economics institute have noticed a problem lately, and I happen to agree with their diagnosis: There is, in their words, an "acute problem" with "BS in the health care industry." As recent examples, they cite Theranos (an easy one), the claims made about IBM's Watson, and even "claims that the proposed CVSAetna merger will turn your local pharmacy into a neighborhood 'health care hub.'" And you guys don't even see a lot of the extremely BS pitches reporters get. I promise this paper is a real thing, not Bob and me in disguise.